With so many options available today, nothing beats having real product samples and swatches of all types of window coverings in your home, so you can see how they look before you buy. Call Blinds Northwest to schedule your Free consultation. 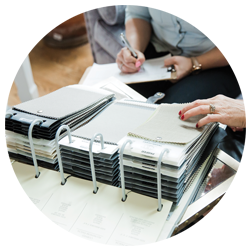 Our Consultants are dedicated to giving you design help to create a home that reflects your personality, and completes your home look. Blinds Northwest offers FREE in-home consultation that beats running from store to store or taking your chances online. If you’re not happy with your window coverings, we will work with you until you are satisfied. When looking for blinds for our new place, I chose Blinds NW based on customer reviews and they did not disappoint. Hillsboro, Banks, Forest Grove, North Plains, Scappoose, Washington County, Aloha and Helvetia, and surrounding areas.